Yes, dear readers, it’s official: I have lost my mind! 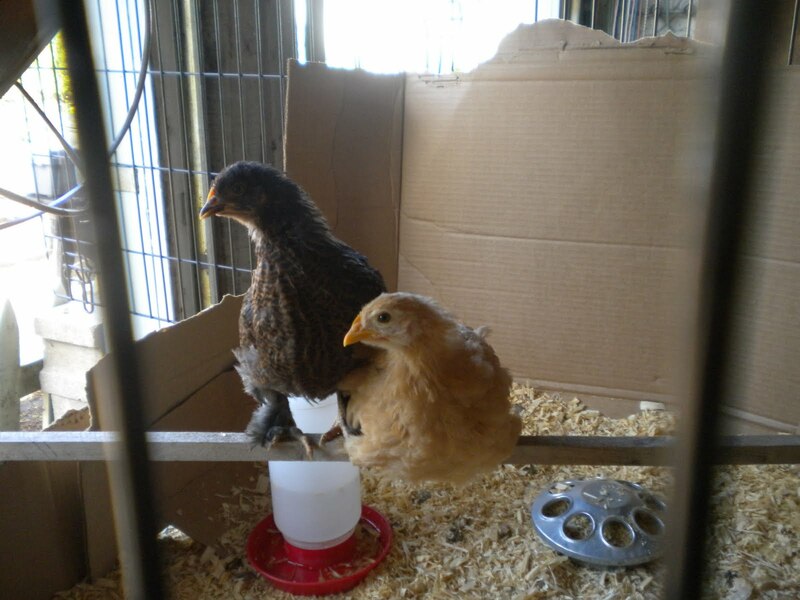 Yesterday, I added two more chickens to our little flock, and plan to add one or two more in a month or so. My doctor said I’m not allowed to take a nap in the afternoon any more, and since it was cold and rainy I couldn’t go for a walk. I figured it was a good day to go visit Nature Berry Farm in Macedon. Just to look at the chicks, you know. Kill some time. Get out of the house. OK, I confess. I knew they had Sicilian Buttercups and I wanted one. Then we went to see the birds that are about 7 weeks old, and ta da! After talking with Jim, I decided the Buttercup probably wasn’t a good bird for our flock because they’re better free range. But I fell in love with the cochins. Tempermentally, they’re a lot like my Polish hens, Lucy and Ethel. But they’re fluffy birds with feathers on their feet. One is a Buff Cochin, the other a Partridge Cochin. Too cute. 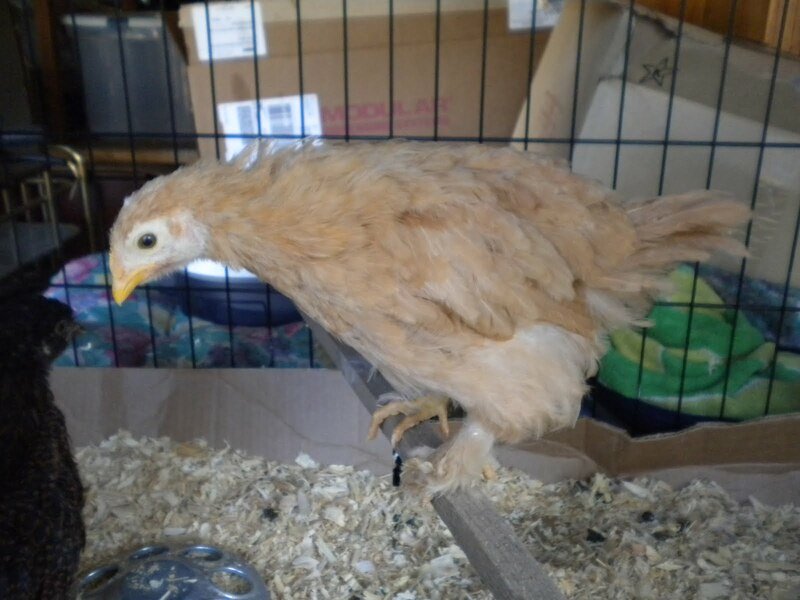 I think I’ll name the buff hen Camilla – after Gonzo’s girlfriend – or maybe Cornelia, and the partridge Elenore. I was going to name her Shirley – get it? Shirley Partridge? – but I thought that was too goofy. 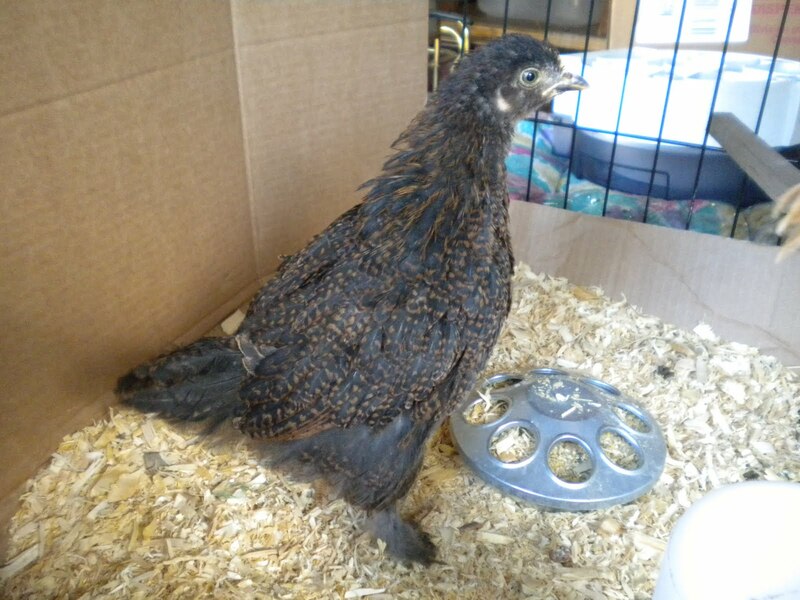 I went to the village office today to get a permit for 4 more chickens – because I am getting at least one Silkie – and of course caused a big snarl of red tape. Even though they won’t be in the coop for a month or more, giving us more than enough time to configure the sleeping situation, I couldn’t be sure I had the required 4 sq. ft. of inside space. So I couldn’t get a permit for 4 birds. I could only get a permit for the 2 I already bought, and Jim the building inspector is coming over Thursday to … well, inspect the buildling. But ta da! Turns out our coop is actually big enough to give 8 chickens their 4 sq. ft. required by building code! I’ll definitely figure out how to house the two Silkies before I get them. Here’s the dilemma: the Cochins, the Polish, and the Silkies are very similar in personality. Timid, mild mannered, easily picked on. The other four – Orpington, Rhode Island Red, Sussex, and Wyandotte (aka Mrs. Beasley) may end up picking on the more timid birds. So I may end up having to have two coops to keep them apart. I don’t want to make any major renovations to the coop and then have to actually separate the birds. But I have time to find out, now that I know the coop is the right size. So there you go: two new chickens! Visit my new blog, Notes From The Funny Farm, and don’t forget to follow me on Twitter! 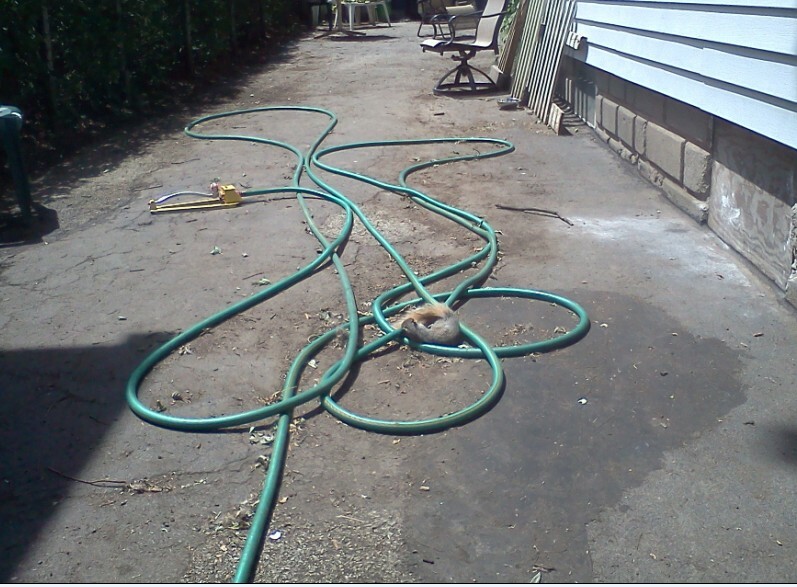 I asked Jim the building inspector to come over and check our chicken coop before we enclosed the entire run, so that if there was a problem we could correct it while it was still easy to do it. The only thing left to do on the actual coop is paint. 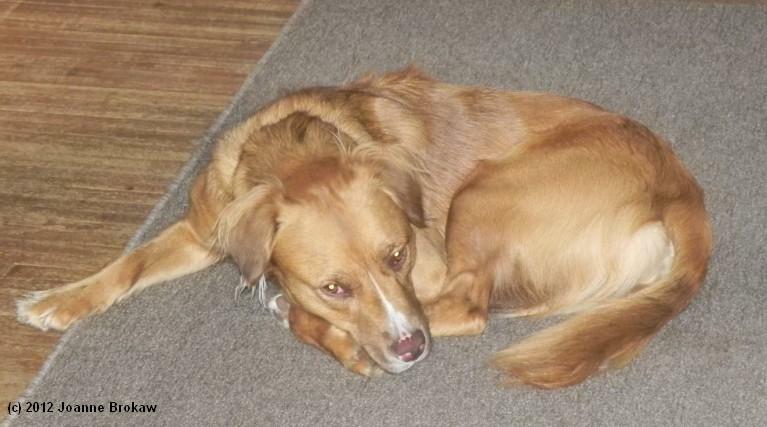 Larry said he’d wait in the front yard while Jim came to check the coop, but I offered to put the dogs in the house. I probably should have let him do that, considering what happened next. Neither man looked too happy to be there, which made me nervous. They both commented about my new 45 gal. garbage pail for the coop and explained that there’s actually a code about how big a garbage can can be. When I asked how big, they looked at our regular (and much bigger) can and said, “You don’t want to know.” The 45 gal. pail is good. Then Larry started looking at the neighbors’ houses and making a list of citations. While he was doing that, he stepped in dog poop. Rats. I thought I’d gotten it all. Our neighbor Dave in the back had been worried the inspector would notice his unfinished shed, and that’s the first thing Larry noticed, along with his trailer. I begged him not to cite Dave; I told him I didn’t want our neighbors to suffer because I’d called them. Larry said that’s what he does; he checks out everyone’s houses when he gets a chance to go in someone’s back yard. Double rats. He noticed another neighbor’s rotting roof, and then the paint peeling on our garage, and the old fence dividing our property line. Triple rats. I just told him about our roof problem before he could find it. Then I begged him not to cite us, since I had actually called them out because I was trying to do things the right way instead of just doing stuff and hoping no one noticed. He said he understood and he’d come back out on June 1 to make sure the paint was fixed. He wouldn’t cite me now but if it wasn’t done, I’d get a letter. I don’t think he’ll cite me for the garage roof; I promised we’d get on that in the spring as well. But who knows? As for the coop, Larry’s first thought was that he couldn’t believe I didn’t need a permit to build it. That made me nervous. I’ve been talking to Jim the inspector about the coop since before I even ordered the chickens. I wanted to make sure that I did everything the correct way; I’m obsessive like that. 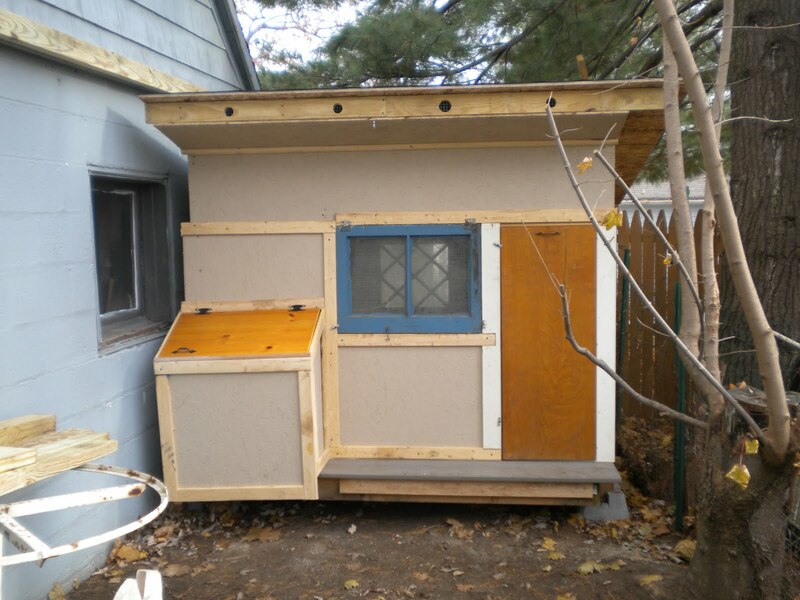 In September, Jim told me that I needed to apply for the permit to get the chickens, that I didn’t need to have the coop built before the chickens arrived (since they’d be in a brooder) and that I didn’t need to have the plans approved ahead of time. I hope that we didn’t miss anything. They checked to see where the roof water ran off (yup, onto our property). And Larry said that he thought the inside was just barely 6×4. I need 4 sq. ft. per chicken, so that’s the minimum size the coop can be for our 6 chickens. Larry was also concerned about it’s proximity to houses; I pulled out the code and read him where it says the coop needs to be 25 feet from any dwelling, which it is, and which I thought was all we needed to follow. That seemed to satisfy him. Maybe. Then they wandered out front, Larry looking for things that were wrong the whole time. Jim didn’t say much throughout the inspection. When they were getting ready to leave, I asked Larry if the coop was OK. I told him I wasn’t really ready to put the chickens in there today, but that we wanted to make sure it was OK before we enclosed it in the run. And I might need to put them in there while I cleaned the crate. Larry said, “Don’t look at me. Jim’s doing the inspection.” Jim’s answer was a bit vague but I think the coop is OK. I told him we’d call him when the run was done. All in all, it was nerve-wrecking. What I wanted to avoid was having the coop finished and the run enclosed and then having them come and tell us we had to extend the coop by 2 more feet or something. Right now, I’m not 100% sure that the coop is OK. I think it is. But if I paint the whole thing and enclose it, and then find out I need to make it bigger or move it, I’m going to be really ticked. I feel badly for my neighbors. I invited the inspectors to the house, so if they have to cite me for stuff, then so be it. That comes with the territory and I knew that risk when I decided to do this project. But my neighbors are going to get cited for stuff, too. Then again, a building inspector who actually inspects buildings is what keeps a town looking good, and keeps houses safe. So when it comes down to it, I’m glad he does his job. Otherwise, our neighborhood could become a slum and then our property values really would be way overblown. More than they already are. In the end, it’s still better to work with the building inspectors than try and do the project and hope no one notices. I’ve had a few neighbors say that’s what I should have done. I can’t do that. I live in a small town and our houses are close together. It’s important to me that I don’t do something that’ll make life miserable for other people. So, if anyone wants to come over and paint trim or fix our garage roof, let me know! I’ll keep you posted on the coop progress! I’m officially a poulterer … is that a word? I went down to the village clerk’s office today to get my chicken permit. Apparently chickens aren’t a popular pet in E.R. as they had some trouble finding the right forms. They don’t get much call to fill out permits for residents to raise poultry (gee, can’t imagine why not?) so they had to dig for the correct paperwork. When I asked if I was the only one in town with chickens, they said, “You are now.” Apparently someone else had chickens and now they don’t. While I ran and got cash at the ATM (I always forget I can’t use a credit card at the village office) they filled out my license to be a poulterer. To have poultry. Whatever. I can now officially have six chickens in my residence. Well, not in my residence. At my residence. You know what I mean. I'm officially a poulterer … is that a word?